The feminist movement refers to a series of campaigns on issues pertaining to women, such as reproductive rights and women’s suffrage. The feminist movement is divided into three distinct waves, beginning in the nineteenth century and continuing through the late twentieth century. First-wave feminism is a period of feminist activity during the nineteenth and early twentieth centuries in the UK, USA, Canada, and the Netherlands that focused primarily on women’s suffrage. Second-wave feminism is a period of feminist activity from the early 1960s through the later 1980s during which time women tied cultural inequalities with political inequalities as a part of their cause. Beginning in the early 1990s, third-wave feminism was largely a response to the perceived failures of the second wave feminism. The formation of the United Nations and the work it has done regarding advancing women’s rights in a variety of contexts and places has added a global dimension to the feminist cause. Second-Wave Feminism: Second-wave feminism is a period of feminist activity. In the United States it began during the early 1960s and lasted through the late 1990s. It was a worldwide movement that was strong in Europe and parts of Asia, such as Turkey and Israel, where it began in the 1980s, and it began at other times in other countries. First Wave Feminism: First-wave feminism refers to a period of feminist activity during the 19th and early twentieth century in the United Kingdom, Canada, the Netherlands and the United States. It focused on de jure (officially mandated) inequalities, primarily on gaining women’s suffrage (the right to vote). The feminist movement refers to a series of campaigns for reforms on issues such as reproductive rights, domestic violence, maternity leave, equal pay, women’s suffrage, sexual harassment and sexual violence. The movement’s priorities vary among nations and communities and range from opposition to female genital mutilation in one country or to the glass ceiling (the barrier that prevents minorities and women from advancing in corporate hierarchies ) in another. First-wave feminism refers to a period of feminist activity during the 19th and early twentieth century in the United Kingdom, Canada, the Netherlands and the United States. It focused on de jure (officially mandated) inequalities, primarily on gaining women’s suffrage (the right to vote). Second-wave feminism refers to a period of feminist activity beginning in the early 1960s and through the late 1980s. Second Wave Feminism has existed continuously since then, and continues to coexist with what some people call Third Wave Feminism. Second wave feminism saw cultural and political inequalities as inextricably linked. The movement encouraged women to understand aspects of their personal lives as deeply politicized, and reflective of a sexist structure of power. If first-wavers focused on absolute rights such as suffrage, second-wavers were largely concerned with other issues of equality, such as the end to discrimination. Finally, the third-wave of feminism began in the early 1990s. The movement arose as responses to what young women thought of as perceived failures of the second-wave. It was also a response to the backlash against initiatives and movements created by the second-wave. Third-wave feminism seeks to challenge or avoid what it deems the second wave’s “essentialist ” definitions of femininity, which (according to them) over-emphasized the experiences of upper middle class white women. A post-structuralist interpretation of gender and sexuality is central to much of the third wave’s ideology. Third wave feminists often focus on “micropolitics,” and challenged the second wave’s paradigm as to what is, or is not, good for females. 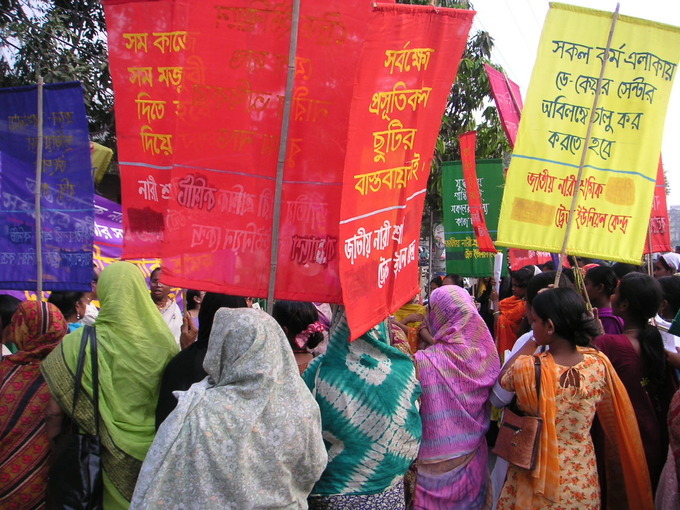 International Women’s Day Rally: International Women’s Day rally in Dhaka, Bangladesh, organized by the National Women Workers Trade Union Centre on 8 March 2005.